O2 U.K. was one of the first to add the new iPhone 5c to its website, and its cheapest deal will see customers paying £50 ($83) up-front for a £28 ($47) contract over two years. If you want the handset for free, you’ll be paying £43 ($72) per month. 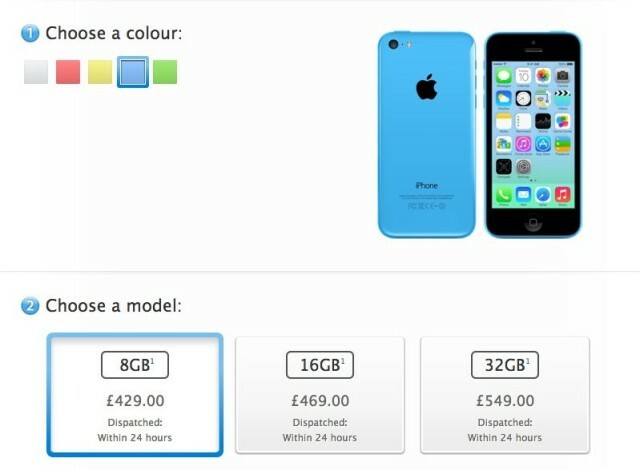 In comparison, the carrier charges £90 ($150) to get the 16GB iPhone 5c on a £33 ($55) a month contract. Those in the U.K. can also get the 8GB iPhone 5c on various carriers through Phones 4U. Aside from its storage differences, the 8GB iPhone 5c is identical to its siblings. It boasts the same 4-inch Retina display, an A6 processor, and an 8-megapixel iSight camera. It’s thought Apple has launched the cheaper device in an effort to combat disappointing iPhone 5c sales ahead of a refresh this fall. According to recent figures from analytics firm Mixpanel, iPhone 5c growth has been stagnant since Christmas. Carriers and retailers all over the world have been slashing prices in an effort to shift stock, and Apple has invested more money in online advertising in the hope that it will boost its popularity. Analysts will be quick to note that the iPhone 5c was always going to be a flop thanks to its price tag. The device was expected to be a “budget” smartphone designed for emerging markets, when in reality, it’s only $100 cheaper than the high-end iPhone 5s, and still far too expensive for those on a budget. The 8GB iPhone 5c is also expected to reach the U.S. later today.